The USB-C Mini Dock/Metal is designed for extra connectivity demands. With this docking station, you can extend the connection of a computer to more USB peripherals such as Ethernet network, the microphone and the speaker. 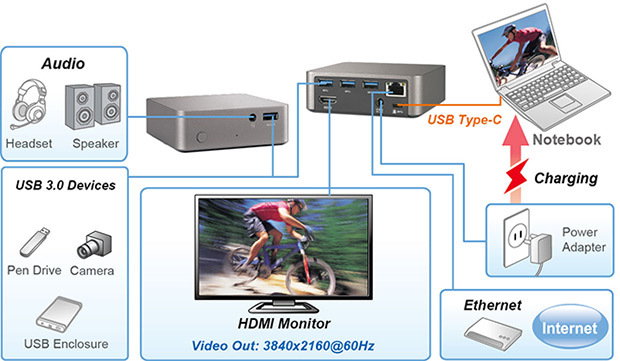 Adopting USB Type-C interface and a single cable, you can transmits data at high speed, output 4K video display via VESA DP Alt Mode and charge your connected laptop. Particularly, this docking station supports power charge up to 85W for Macbook Pro 15". In addition, this docking station is equipped with video output. With HDMI port, you not only can mirror your primary screen but also can extend your desktop allowing visibility of more applications at the same time. The USB-C Mini Dock/Metal also features stylish appearance, aluminum upper chassis and four fashionable colors- space grey, silver, gold and rose gold, to match your preference and style. *Incorporates HDMI® technology.